May 19, 2018 in St. Petersburg the EcoWave (Ecowolna) expedition – the scientific and technical festival has began. The expedition is held within the framework of MARINET’s project “Engineering Competitions”. 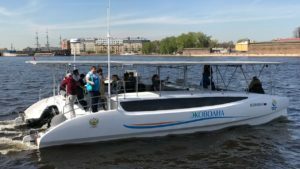 The solar powered catamaran departed from St. Petersburg on the route Veliky Novgorod – Moscow – Astrakhan. 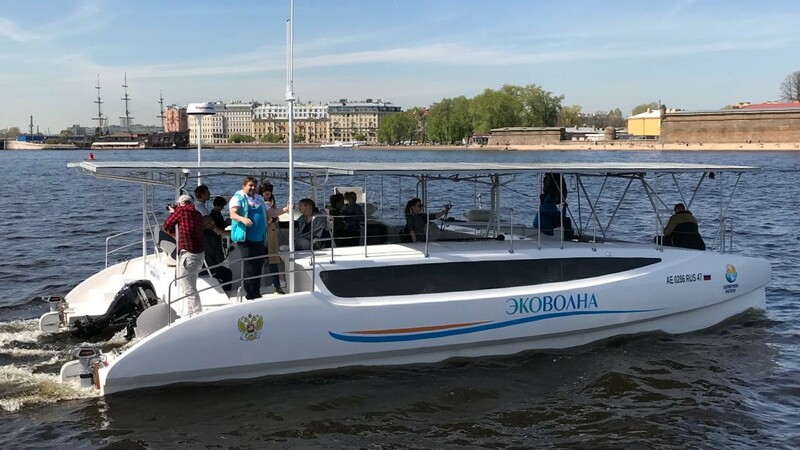 From the Baltic to the Caspian Sea along the rivers Neva, Oka, Volga, the catamaran will pass more than 5000 kilometers through 20 regions of Russia within 90 days. This project is aimed at the development of the high-tech water transport, which can be launched into mass production soon. Also, it opens the scientific and creative potential of young specialists involved in the project. And during the expedition the members will provide several researches and will gather valuable scientific data. During the three-month expedition in more than 40 cities along the way press conferences and educational meetings with local students and schoolchildren will be held. Onboard together with a permanent professional crew there will be scientists, ecologists and partners of the expedition from the leading Russian universities replacing each other in each port: Lomonosov Moscow State University; MGIMO, Institute of Geography of the Russian Academy of Sciences. According to the results of the expedition, an interactive ecological map of Russia will be compiled, and a survey of the infrastructure of ports and shipyards along the route of the catamaran will be presented. The project leaders plan that eco-friendly vessels may appear in the large cities of the country soon. “In September, by the end of the expedition, we plan to launch a pilot project of river trams for 30 seats. They will be built based on the solar powered catamaran. The pilot project will involve Moscow and St. Petersburg,” – said Yevgeny Kazanov, project leader and Director of the National Center of Engineering Competitions and Contests.